Resolution: 1920 X 1080 (1080P) Dimensions: 61.2" x 36.4" x 3.9"
Copyright © 2009 PlasmaTVBuyingGuide.com. All Rights Reserved. Whether using this very impressive plasma as a home theater centerpiece or as a public display for a fine garments store you will get very solid performance. I expected local deviation in color and motion artifacts from this giant as opposed to its smaller relatives. Not the case at all. It performs in very much the same manner as the smaller plasma TVs. It has the same style of color rendition and white balance as the smaller Panasonic plasma products – though I did not experience the blacks as intense as they are on the smaller plasma products. This is a natural by-product of the larger screen and partially to be expected. HD Video Testing: My overall impressions were that the color was realistic and accurate – not over saturated but still pronounced. 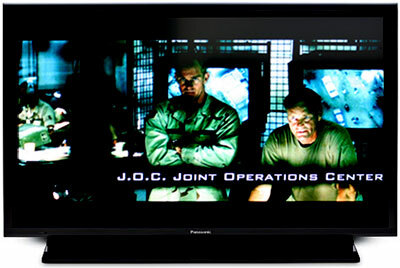 The plasma displayed excellent dark scene detail which is a sticking point with most displays with a super high definition signal. While viewing our test 1080p DVD Black Hawk Down, we could clearly see the acne, sweat and cracks in Aidid’s and Sam Shepard’s faces during their face to face cigar smoking confrontation. The flesh tones were incredibly realistic. Emulating this type of performance with this much film-transferred dark scene material is a very tough test. In a couple of scenes some of the mesh camouflage netting behind a couple of the tents displayed some mapping and banding. I didn’t see it as an ongoing problem that existed however, rather an anomaly of the original content from those individual scenes. 480i and 480p Resolution Signals: Panasonic's upconversion processing has been good for some time. The upconversion from 480i was excellent. From close up around 10 feet there are some visible motion artifacts present depending on the quality of the original programming. Much improvement has been made in cleaning up the picture. The two prominent innovations Panasonic has made to clean up motion artifacts have been 1) stellar black levels (while not as great as Pioneer), 2) super gray scaling to allow for the best dark shadow detailing in the industry. The commercial versions of plasma product also do not contain as much needless picture enhancing technology which can distort and create extra picture noise. From the Standard Picture Setting Adjustment Option. Commercial plasma TVs such as this one are not overly saturated for the showroom floor as consumer models are and therefore are easier to adjust from the Standard setting. Processing Testing: The 3:2 pulldown processing in this TV was super, while 2:2 cadence testing was mediocre to poor. The only bad option on this plasma (which is not set to overwhelm the showroom floor like consumer models) is the dynamic mode, which should only be used in extremely bright display conditions such as a trade show floor. The dynamic mode naturally superficially enhances (by increases the sharpness control) edges and tweaks contrast while decreases brightness. The choice of these preset picture modes will depend greatly on the surrounding lighting in the viewing room as well as the signal being input. For HD signals you will not need as much contrast to see detail and depth in the picture. With lower end signals you may to use a slightly increased contrast setting such as with super cinema mode. The just (meaning justified) aspect ratio mode did an excellent job with algorithmically "stretching" the picture for pleasing viewing. The aesthetics of the TH-65PF11UK is a high point for me. I like the simple non-obtrusive design of the inch and a quarter bezel in charcoal black. It doesn’t take away from the picture image. The TV is also super thin for such a huge screen, at only 3.9 inches in depth. While speakers are not included with the TV, inbuilt amplifiers for speakers are. Adding a couple of good quality book shelf speakers will give you superior sound quality to any TVs inbuilt speakers. The remote control is easy to use and has a convenient aspect ratio button control making this important adjustment accessible without the menu. It also contains 4 HDMI input selection buttons on the remote for easy toggling between HD input sources. In some ways commercial plasma products are no frills TVs offering none of the fancy features (that you will likely never use) like parental lock and Internet connection, or an SD card slot for viewing photos. The menu system is very easy to navigate and the unit has plenty of preset picture settings as mentioned above as well as plenty of aspect ratio settings which include the aforementioned Just mode. If you are using this plasma has a home theater TV, chances are you will have a universal remote to cover this function. The one drawback in the menu options of course is the limited color adjustments. The picture settings which you choose can be set individually for each input, allowing for flexibility with your signal input. This plasma monitor has optional accessory cards so for a little more money you can set the inputs exactly the way you want them (This can been seen as a drawback, because of the limited included inputs, or as a positive due to the option of purchasing and implementing the inputs however you want them.) The included inputs are one composite, one VGA 15 pin, one RS232 port, and one BNC component video input. This plasma has the ability to show PIP or side by side picture from different inputs – so practically the user can answer e-mail on one side of the screen while watching a ball game on the other. Lastly, this plasma is sold without a table top stand or speakers. Surprisingly, I believe the TH-65PF11UK is a good value at around $6000 (the TH-65XV100U is more expensive due to the brushed aluminum bezel). I was pleased with the solid picture performance even with standard def signals and in comparison to the 65" LCD televisions on the market, this TV is a bargain. Samsung presents tough competition with their PN63A760 and Samsung PN63B550 priced at around $3500. 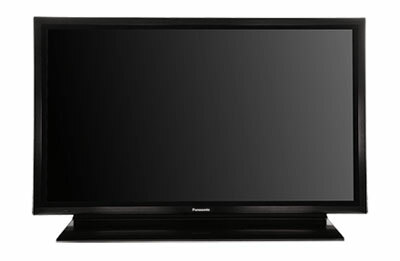 Although it lacks some of the advanced noise reduction capabilities of the latest Sony XBR LCD and some of the brilliant colors from Samsung LCD and plasma, and the deepest darkest blacks from Pioneer the overall performance of the Panasonic plasma is a force to be reckoned with.